There are many kinds of dents in sheet metal. Dents come in large and small sizes. They can be a crease, a shallow egg-shaped depression or just a little ding. What they all have in common is that they are distortions in the shape of the metal. A dent, no matter what its shape, is a place where the metal has been stretched. While there are as many ways to fix dents as there are automobiles, one major thing to remember is that you have to gently get the metal unstretched in order to bring the dent back to its original shape. We generally use body hammers and dollies to pound out dents, but sometimes a heating torch is needed to relieve tension in the metal structure. We'll leave that particular practice for another article, along with pulling out dents that can't be accessed from the reverse side of the panel. Body hammers come in lots of shapes and sizes and weights, as do hammering dollies. Here's a selection of inexpensive pieces. 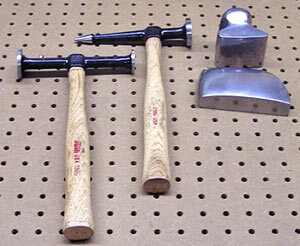 The way to choose which ones to use is to examine the dent carefully and then choose the best-shaped and smallest hammer that will do the job, along with the dolly that has the closest curvature to the panel you are working on. If you don't have body tools, use a ball peen hammer and solid metal scrap piece as a dolly. No matter what you use, remember that you can do a lot with a little but not a little with a lot! Use the smallest hammer always. It may take a lot of taps but at least you won't do too much damage. 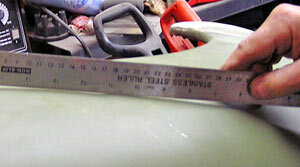 A straight edge clearly shows the dent. In the case of our fender here, the dent is rather typical. It's in the side of the fender and oval-shaped, about 3 inches long and 2 inches wide. 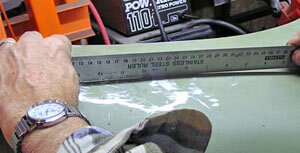 It's always best to put a straightedge over a dent to determine its depth. Then you want to choose a hammer that will "fit" the job best. In our case we used a hammer with a large, flat round top. Doing so made sure the overall force of the blows would be evenly transmitted over an area of a couple square inches, helping bring the total concave surface back without creating little pin-sized mounds. After a few taps, we lifted the dolly and examined the dent's metal surface. This is when you ask yourself the question: Are your taps beginning to lessen the depth of the dent? Are your taps showing up as little convex dents in the surface? (If the latter is the case, get a hammer with a larger head). Although it's hard to determine from these photos, the head of the hammer strikes the sheetmetal flat against the surface. At the same time we hold the dolley directly over the area the hammer is striking. We saw that the dent hadn't moved at all, so we put the dolly down again and started hitting the inside of the dent harder. After a few well-aimed, forceful (okay, we bludgeoned it!) hits, the dent popped out nearly perfect with the surface. There was one spot, however, that stood up too high. 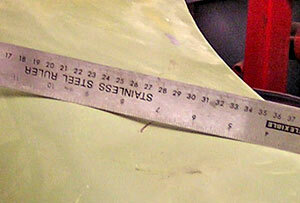 After the dent popped out, it left a slight raised section, which is easily seen under the straight edge. This sort of thing easily happens, and there are two ways to relieve the area that is now too high, commonly known as a reverse-dent. In this case we put the dolly on the underside of the fender and gently tapped the convex (high) area with the smaller head of the hammer. Successive hits (not too hard!) eventually brought the surface down to that of the rest of the fender. If that hadn't worked, we would have gone to Plan B. This involves heating the convex portion with a torch until it glows a dull red, then leaving it to cool. 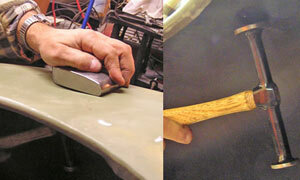 If things go well, the metal shrinks (relaxes) back when it cools and leaves the surface very close to original. How Do You Know If The Repair Conforms To The Original Surface? Using the body file, we identified the high spots that needed additional attention. Light tapping only at this point, because you don't want to overdo it. That's where a file comes in. Notice that we filed the dent area, scraping off the etching primer that coated it. When you file the surface you will quickly notice which areas are still low and which are high. The surface is back where it should be. How far you go to make things "perfect" is up to you. You can keep working the dent area until your file shows the metal surface is absolutely "dead-on," or you can leave little imperfections (low spots only) to be filled later with body filler. Keep in mind, though, that overworking the metal can cause it to become brittle; then it might begin to crack rather than bend.